This is tasty, nutritious paratha that looks as appealing as it tastes. This is a great way to sneak in greens in your kid's tiffin. 1 large bunch spinach about 250 gms. A few sprigs of dill leaves about 50 gm. Clean the spinach and dill leaves well and drain the water. Blend together spinach, dill leaves, garlic and chillies to a smooth paste. Don't add water or add about 1-2 tsp. Take the flour, add the blended spinach dill paste, add in all the other masalas along with salt and knead a soft dough. Put a tsp. oil at the end. Roll it out thin to paratha width. Fry on a hot griddle on both sides using a little oil. 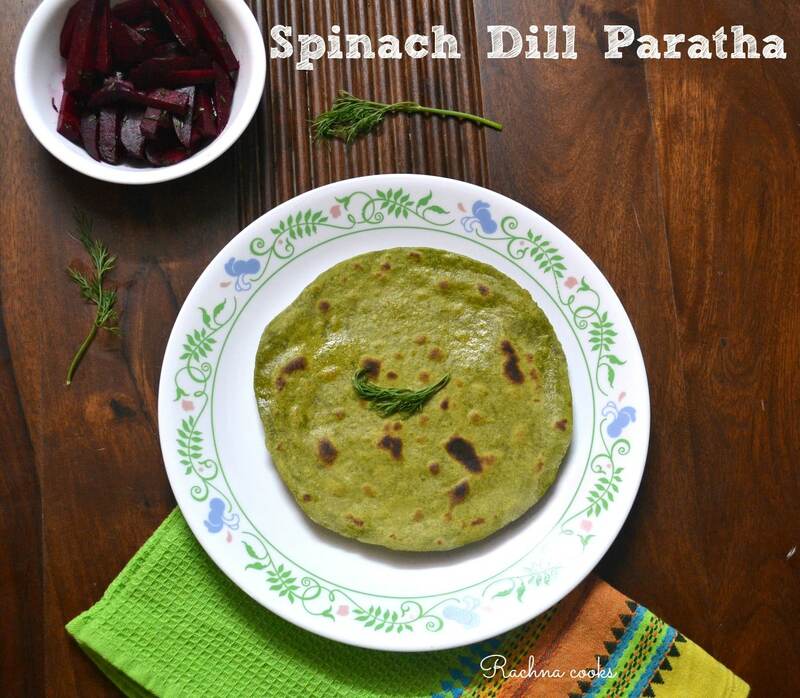 Your spinach dill paratha is ready to serve. Serve hot with chutney, pickle and curry, dal or curd. Enjoy. You can use a combination of greens eg. spinach, bathua and dill or methi and dill or a mix of all greens. Dill gives it a nice flavour so it is good to include it. Adjust the chillies to your taste. Skip ginger-garlic paste if you wish to cut down spice. Serve with pickled beetroots to add even more iron to the meal. It tastes good too. This tastes good even when cold so you can safely pack it in your kids' tiffin boxes. They will love its taste and colour.